There are many ways you can increase traffic on your website, including guest blogging, social media and paid advertising. Paid advertising simply means buying traffic with online ads. There are several types of paid advertising, and the two most common ones are Pay-Per-Click (PPC) and Pay-Per-Impression (PPI). PPC is good when targeting search engine users – they are more susceptible to links that look like something they are searching for. Google AdWords is one of the more popular PPC platform. Another one is Facebook Ads. PPC vs. PPI, which is better? It is difficult to say if PPC or PPI is more effective, as both has their strengths and weaknesses. PPI rates are usually more inexpensive and it is easy to apply a budget since you are only pay for a certain amount of views. PPI also guarantees that you ad will be shown the number of times you paid for it to be seen. However, it doesn’t measure how many people actually clicked on your ad. Using our “natural dog food” example above, when you type in a search, Google will yield two main types of search results: organic and sponsored. 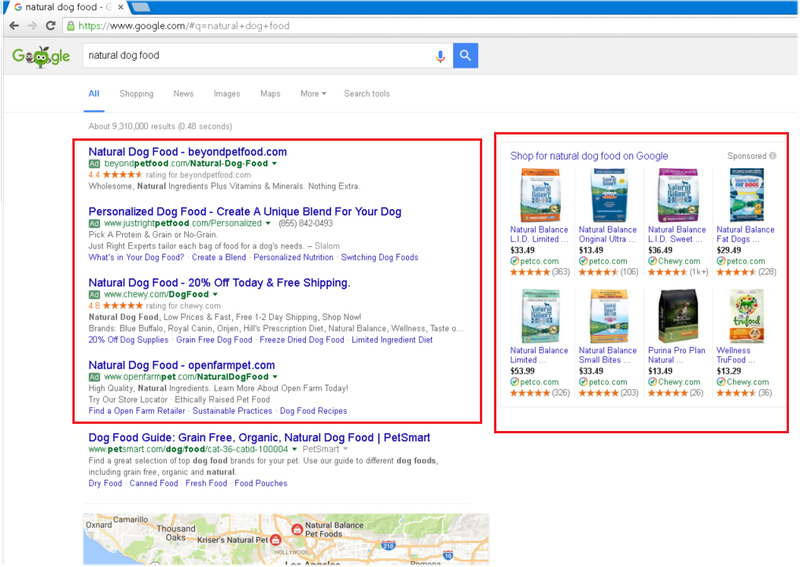 You will click on the most relevant result, and very often it will be one of the sponsored results because they are more targeted to the specific product you are looking for (in this example, natural dog food). And of course, Google has a tool, Traffic Estimator Tool that helps you get an idea on how much your keywords will cost you per click on Google. Consumer performs a search and Google digs into its pool of AdWords advertisers and chooses a set of winners to appear in the ad space on the search results page. The winners are chosen based on a number of factors, including the quality and relevance of the keywords and the size of their keyword bids (ie. the more you are willing to pay, the more likely you will be chosen as a “winner”). Google bills you for that one click. 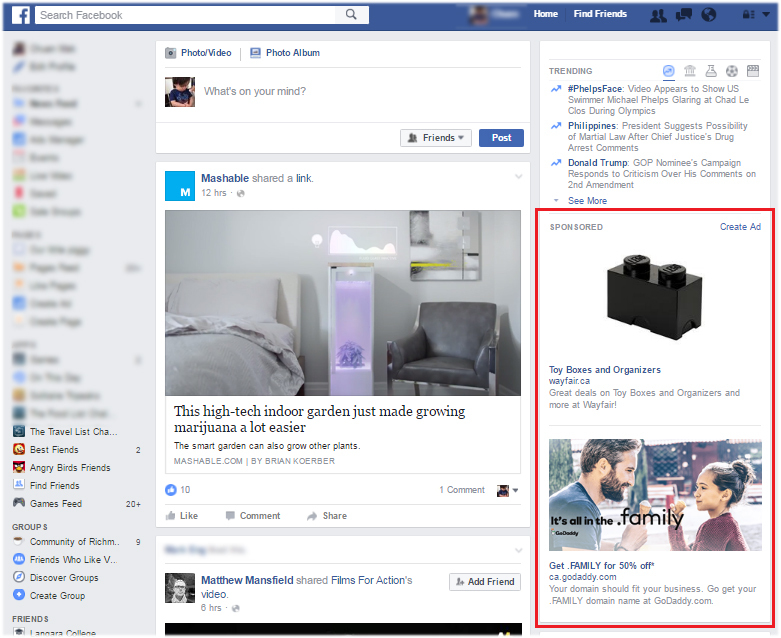 In a way, Facebook ads is a hybrid of Google AdWords and Google AdSense. Basically, Facebook allows you to target very specific demographics of Facebook users, including location, gender, age, interests, languages, and even behaviors (ie. their shopping behaviors, if they are in the market for a new car, etc.). In fact, with Facebook’s Precise Interest Targeting, you can target users based on information in their profile including likes and interests, Pages they like, apps they use and other profile/timeline content they have provided. You can learn more about ad-targeting on the Facebook Ad website or stay tuned for our in-depth article “Advertising Your Website on Facebook”.